It all started over in the United Kingdom with dressmaker, Thelma Madine. 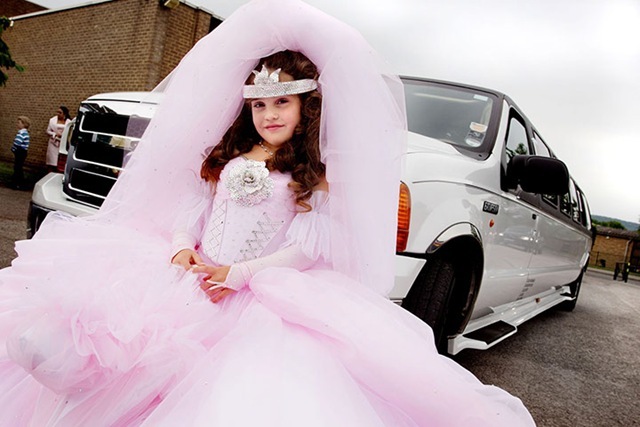 I got a glimpse into the world of Gypsy weddings. And I was hooked! Each week, I’d tune into TLC’s My Big Fat Gypsy Wedding and considered running away in hopes of getting an internship with Thelma. 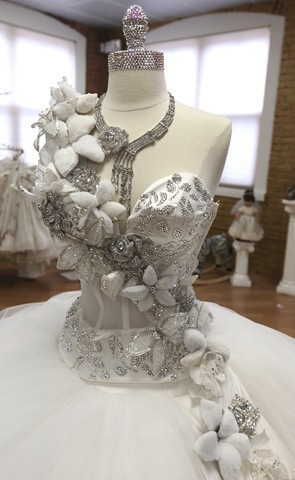 Although I loved the enormous blinged-out wedding dresses she made, I was head over heels about her children’s creations. 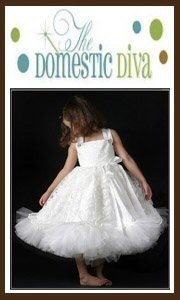 Her Communion and Flower Girl dresses rivaled those of even the tackiest ones here in Staten Island, New York. 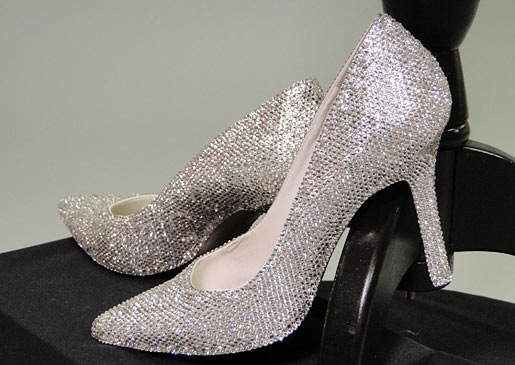 The more tulle and Swarovski crystals, the better! 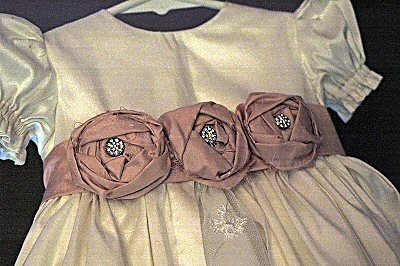 Her Christening dresses were breathtaking! 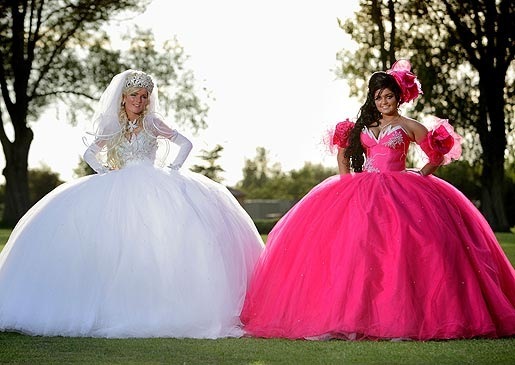 If you’ve never seen the show, you can buy My Big Fat Gypsy Wedding – Season 1 and 2 on DVD! Thelma’s newest show is called, “Little Shop of Gypsies.” She takes on 10 Gypsy girls to teach them how to make fabulous dresses. It is a once-in-a-lifetime opportunity for these girls who rarely get to finish high school. Thelma has recently published her first book, “Tales of a Gypsy Dressmaker. She has an incredible story which includes a stint in prison…LOL! Not to be outdone by the UK, enter the fabulous Sondra Celli, dressmaker of TLC’s My Big Fat American Gypsy Wedding and Bling it On! Her creations are spectacular! That woman and her crew can make dresses that dreams are made of! The wedding gowns are over the top…hundreds of yards of tulle, thousands of rhinestones and enough fabric to cloth half of a large city! 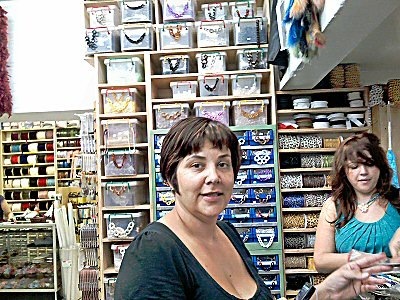 Sondra has a team of girls who are called, “Blingettes.” They spend hours upon hours applying crystals to her creations. Channel Guide Magazine did a great interview with Sondra. Great read! 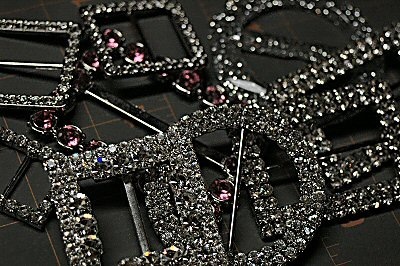 All this BLING reminds me that I need to order more Hot Fix Crystals from my friend, Suzie aka The Hot Fix Queen! Since it’s National Sewing Month, how about some FREE FABRIC? September is National Sewing Month (you can follow along on Facebook)! So I guess it’s time for me to get back to my favorite thing to do: Sewing! I’ve recently stopped working and just got the kids back to school, so I now have my days to enjoy sewing once again. Yippee! First things first. After shrinking my beautiful white smocked shower curtain in the wash, I needed to find a replacement for my Tiffany inspired bathroom. At HomeGoods, I found a black polyester/cotton waffle-weave shower curtain. Although nice, it needs something to make it unique. Searching through my trim stash, I came upon this beautiful sequin trim in Tiffany Blue (I know you’re thinking the trim looks silver, but it’s not in person). Great. But now I need to figure out how to attach the sequin trim to the shower curtain. Do I sew it? If so, what type of sewing machine needle, stitch type and thread do I use? Glue it? Would I use hot glue or another type of adhesive? What about Res-Q Tape? Any suggestions would be greatly appreciated! FREE YARD OF FABRIC TO WHOEVER COMES UP WITH THE BEST SUGGESTION on how to attach the sequin trim! POST YOUR SUGGESTIONS BELOW! The Winner will receive a yard of either Quilter’s cotton or cotton knit in the color of their choice. Contest ends tomorrow at 5pm EST. Dear Martha: Sometimes you are just so creative! I have to say I was quite impressed with the sewing-themed Christmas decorations (Whimsical Workshop) I recently spotted at my local Kmart store in NYC. 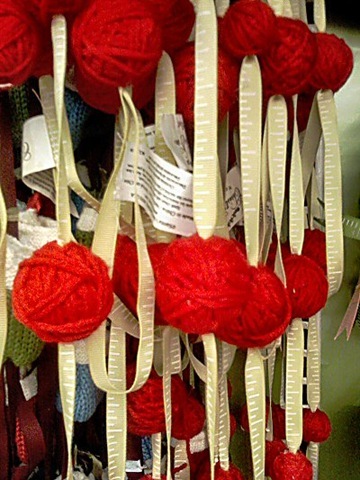 Who would have thought to use a sewing tape measure with balls of yarn as tree garland? Too clever! 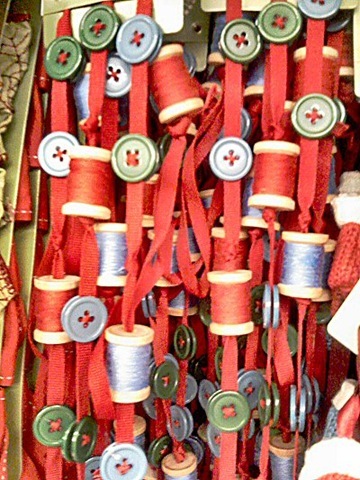 Not to mention your other garland of grosgrain ribbon, spools of thread and lots of button! Ingenious! 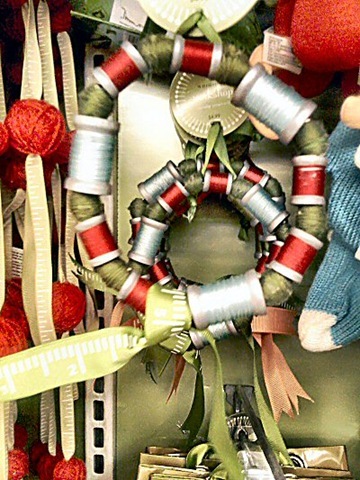 Love the mini wreath made with spools of thread and tied with a sewing tape measure! 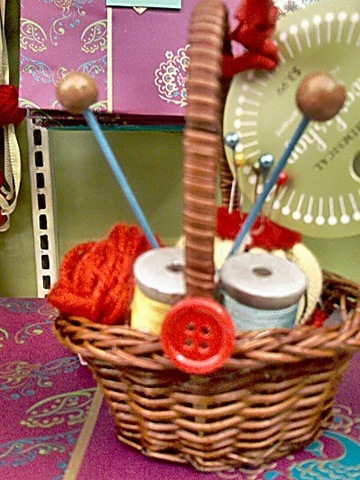 I giggled when I saw your sewing basket ornament complete with knitting needles! 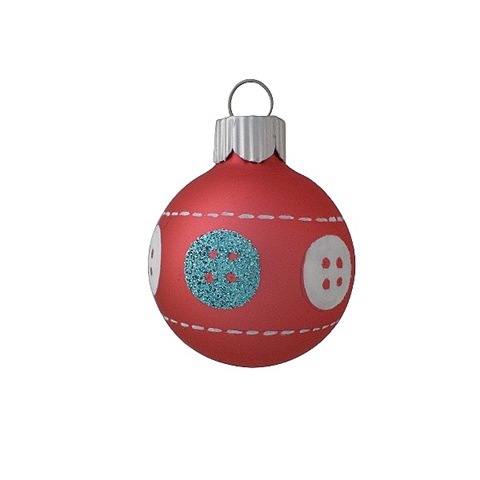 Loved the Button Christmas Ornaments, too! And that flocked velvet ribbon with images of stitching and buttons—too cute! 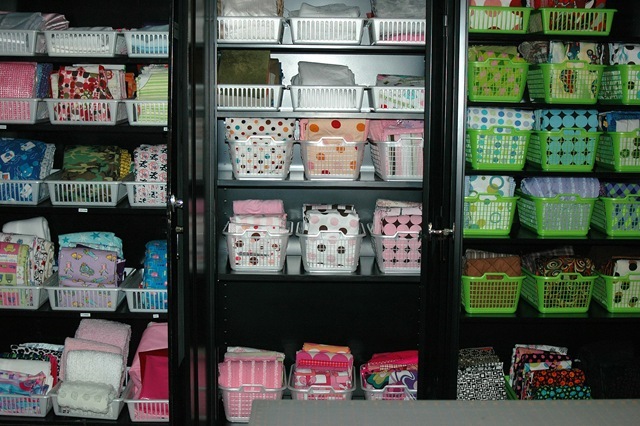 However, my excitement quickly turned to disappointment when I realized my sewing room is PINK, Black and White. Seriously, I dislike anything RED for Christmas. The Chartreuse Green I can live with, but not the RED. Looks like I’ll have to make my own sewing-themed decorations for my Pink sewing room. But Martha, thanks for the inspiration! Can’t believe Christmas is right around the corner! Here’s a few things to make for the holidays! 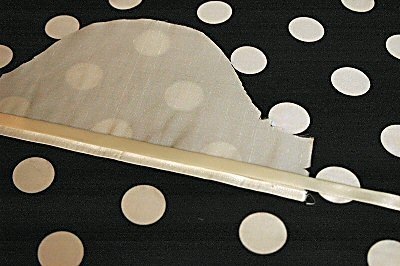 I love this method to making stockings! How clever! What a quick and easy project. 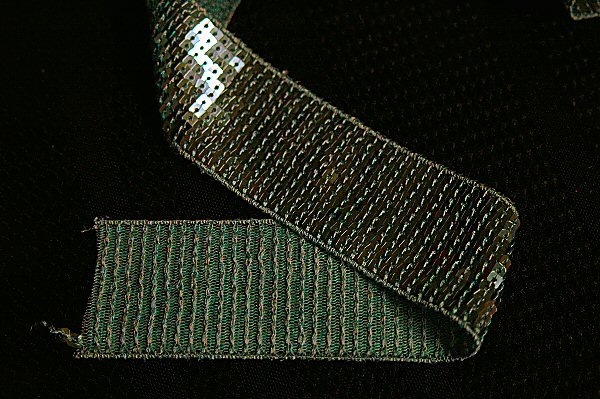 All you have do is be able to sew a straight line. These socks are simple to sew. I’ve made dozens over the years. 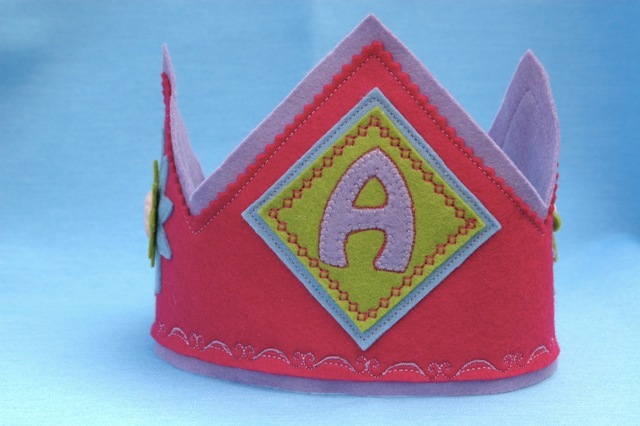 Check out this quick Crown Tutorial by Jessica Levitt. 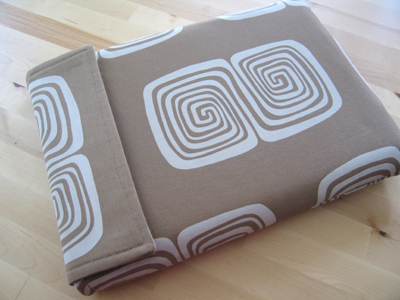 Also be sure to take a look at her gorgeous new fabric line, Timber. Need a gift for your favorite Shutterbug? 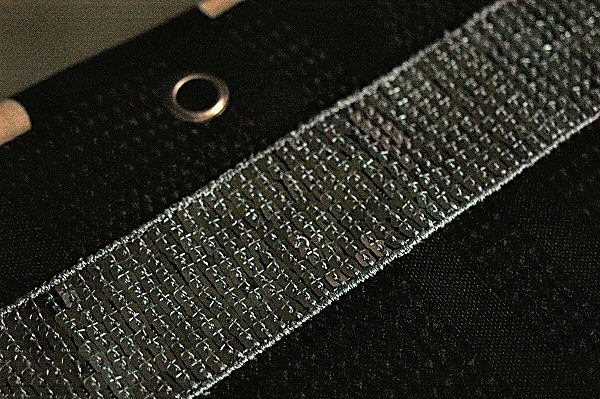 How about this neat Patchwork Camera Strap? Love this easy Laptop Sleeve tutorial! 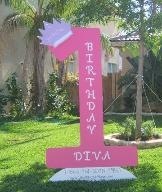 I really need to make one of these for Marielle. Every year after the big BBQ, no matter what, we go to the Fashion (Fabric) District to score some fabric and trim! 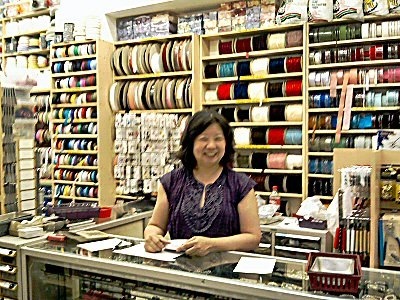 Our mission was to invade Pacific Trimming (my absolute favorite trim, buttons and findings store). 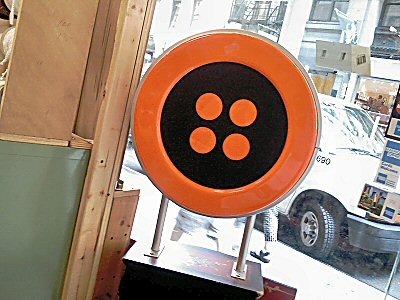 You’ll know you’re at the right place when you see the big arse orange button in the front window. Connie has been helping me find the best goodies in town for several years. Years ago while shopping at Pacific Trimming I accidentally left behind one of my big bags full of trim. When I realized, I called and Connie said she had it and would hold it for me until I was back in the city. For that, I am beyond loyal. 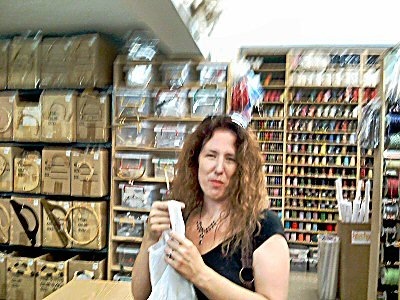 Whenever I bring my out-of-town friends on a fabric shopping adventure, the first place we stop is there! Lady M™ (aka Myrinda of Fabric Hound) has never missed a trip in the last 5 years! Here she is special ordering a top secret item. My dear friend, Jenn (aka Peppermints and Petticoats) recently moved from Canada to New Jersey. This was her first time to the big BBQ and also her first time out shopping the District with me. I think she might have been a bit overwhelmed with all the choices. But the good news is now that she lives closer, we’ll be able to go fabric shopping in the city often! I used to go to MJ Trimmings and really loved all their stuff. However, I can find a lot of the same things at Pacific for a lot less. 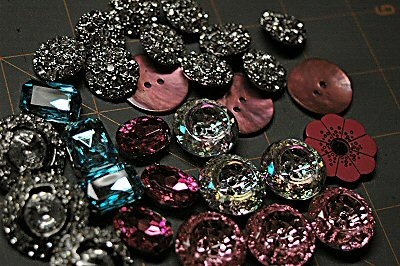 Some of the rhinestone and glass buttons were only $1 each! Of course I needed to restock my rhinestone buckle supply. And with Pacific’s selection, I felt like I hit the jackpot! You can get them for $2 (standard ones) and even the fancy Chez ones for $10! 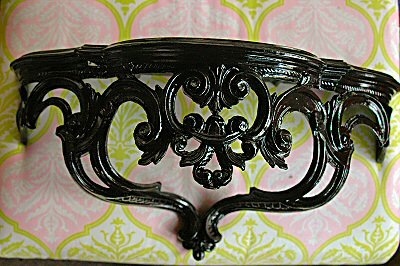 I found some awesome trims at great prices! 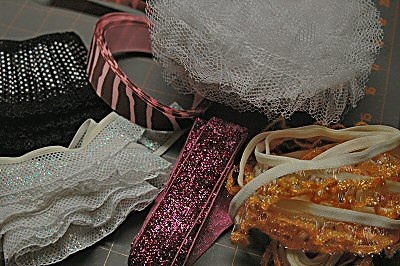 I had to get the polka dot pleated ruffles with black lace edging, a hologram ruffled elastic, chiffon elastic with orange tinsel edging, some soft sparkly pink trim, a double gathered net trim and some pink/brown zebra ribbon. 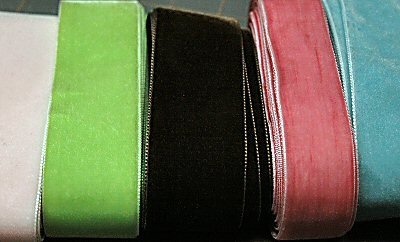 And check out these beautiful velvet ribbons I couldn’t pass up! After leaving Pacific, we stopped into a few other stores where I found some beautiful silk shantung in bright pink and aqua. I even scored a $3 a yard black textured net with rhinestones! But the biggest find of the day was this gorgeous silver metallic open-work fabric encrusted in sequins and crystals for less than 1/2 price (originally $26/yard which I talked the seller down to just $10/yard)! Definitely a successful adventure! Especially when I can do it with my friends! P.S. – I know many of you are waiting to hear about the big BBQ which was held Saturday, August 1st! Let’s just say, I’ll need two blog posts to fill you in with all the details! Stay tuned! I should have smacked myself upside the head. 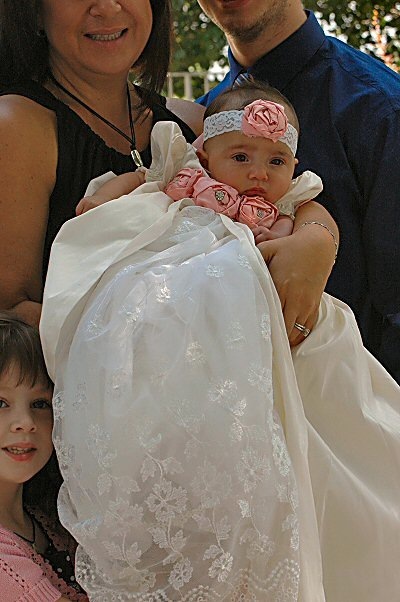 I’d had a month to get the Christening gown for Sophia completed, but ended up finishing it just a few hours before her Baptism. Beyond my usual procrastination, I have a habit of “designing as I go.” I usually have an idea of what I want it to look like. However, I continually change design elements and always end up with something totally different from my original design. Am I the only one who does this? 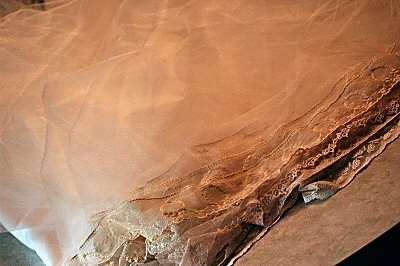 Working with silk shantung is challenging to say the least. And trying to set the tiniest gathered sleeves is beyond nerve-wracking! 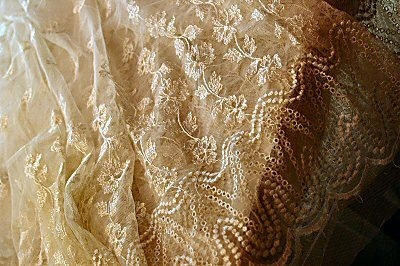 Then I sewed lace and tatting to tulle. At least I was smart enough to do it flat (before sewing up the side seams of the skirts). But the worst was trying to gather 6 skirt layers (1 cotton batiste, 3 tulle, 1 netted lace and 1 silk shantung overskirt) and attach them to the tiny silk shantung bodice. Whew! DONE! To give you an idea of size…this dress bodice is a size 3 months…LOL! It just looks bigger in photos. Ok, so the dress is huge…I think it measures about 48 inches. And oh my…it was HEAVY! At the last minute, I decided to do these silk dupioni spider web roses. I’ll post a quick tutorial this week (once I get another manicure), so everyone can make some, too. 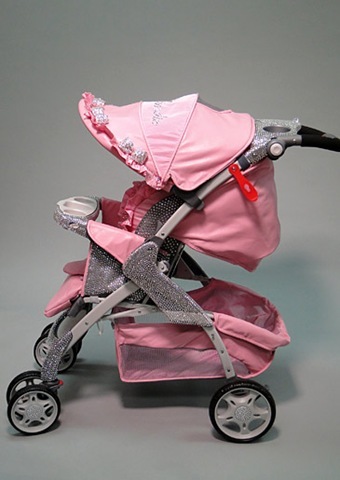 To make dressing the baby easy, I used large sewn-in snaps and covered them with no-functioning rhinestone buttons. 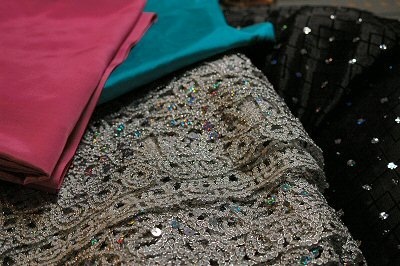 Here’s a close-up of all the skirt layers. 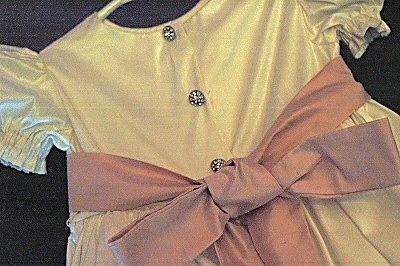 I’ve made several special occasion dresses, but never a Christening dress. This was a first. I’ve been collecting vintage laces and tatting for ages and loved using them for such a precious little girl! Meet Sophia, daughter of my dear friend, Diana (aka Diana of Not Just Bagels)! The Christening gown fit Sophia perfectly! It was such a feeling of accomplishment to see Sophia in the Christening dress. Sophia enjoyed sucking on the big silk roses. Isn’t she beautiful? Diana loved the dress and is going to put it in a huge shadow box to display in Sophia’s room. Wishing everyone a Happy 4th of July! 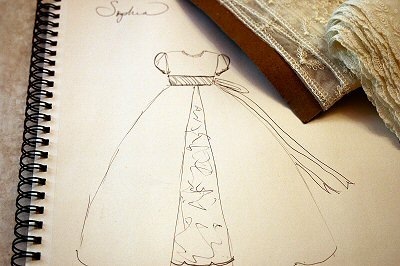 Designing a Christening Gown, Finding a Treasure and Happy Birthday to ME! 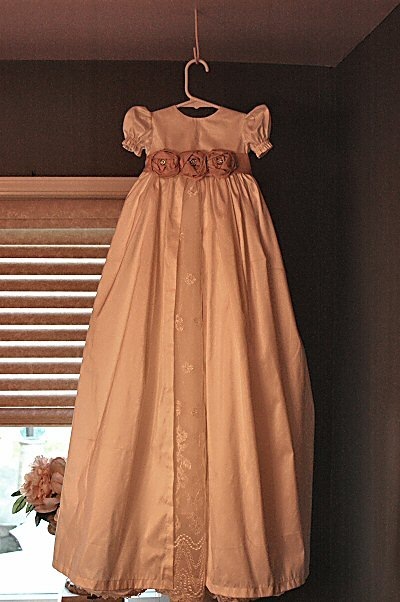 I was so terrified honored when my dear friend, Diana (you know, the one who made all the delicious caramels apples for the big BBQ), asked me to create the perfect Christening gown for her new daughter, Sophia. 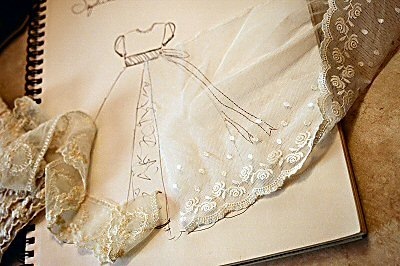 She decided on a simple an over-the-top ivory silk shantung gown with an underlay of vintage lace. Diana is even going to let me add a big vintage pink silk sash which will be tied into a big bow on the back of the dress and embellished with Swarovski crystals. Luckily, I have one of those cool hot fix crystal tools from Hot Fix Suzy™! 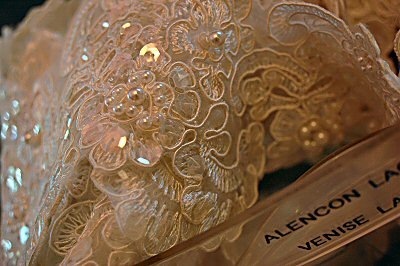 As much as we both loved the alençon lace, it was too glitzy for the Christening gown we’ve envisioned. 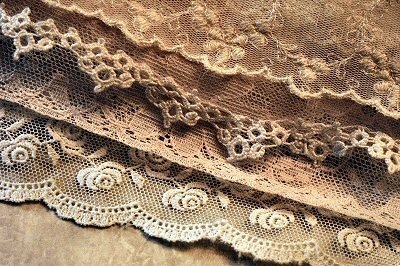 We decided on the perfect lace which has a soft hand. 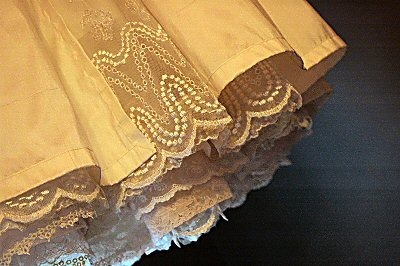 The abundant tulle underskirt layers will be trimmed with various vintage laces…some ivory and some pink! But before I can start on the Christening Gown, I’ll need to tidy up my sewing room…ugh! 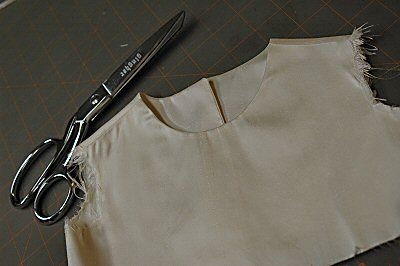 Prior to sewing any special occasion dress (especially whites), I always give my sewing room the Mr. Clean treatment. DONE! Seems I started 14 pair of lounge pants for my daughter, 7 onesies for above new baby and various other sewing projects. Off they all go to the UFO (Un Finished Objects) pile…LOL! Sophia’s Christening is June 28th…so I had better get moving! 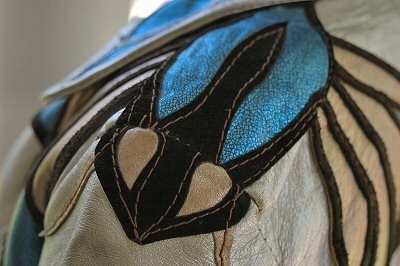 Kathleen of Fashion-Incubator recently posted about a defunct company, East-West Musical Instruments Co., which created the most unique leather jackets. 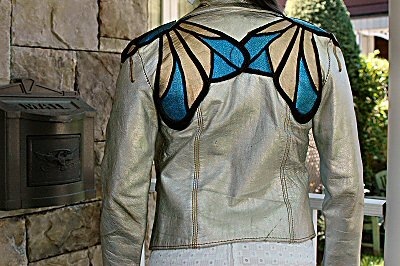 These jackets are a work of art. And wouldn’t you know, I’ve had this beautiful one they created back in the 70s. It was given to me by my childhood housekeeper who received it from Edgar Winter. I certainly made a fashion statement as a teenager as everyone went nuts when they saw this silver leather jacket. I didn’t realize it was valuable. Check this one out. Elvis’ jacket went for over $30,000! 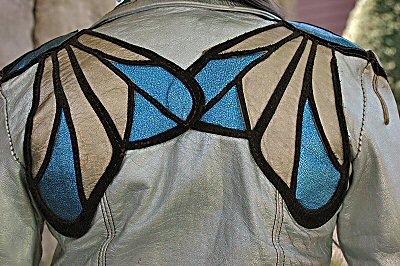 It is marked jacket #432, I believe! 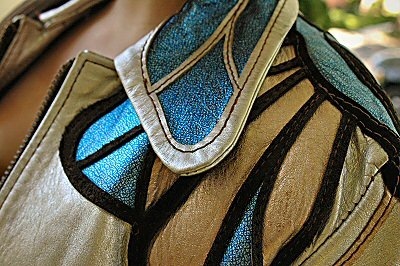 I can’t imagine the hours of pattern making and sewing that went into creating this masterpiece. 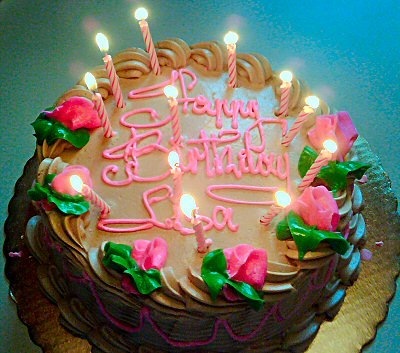 Last week, I celebrated my 46th birthday (May 22nd) with a delicious Mocha Butter Cream cake (thanks to my sister, Linda). I had cake for breakfast, lunch and dinner for two days..haha! And no…that’s not my front lawn above…although it is not below me to get one of those! I did, however, display the obnoxious amount of fresh flowers Mr. Diva surprised me with in the front window. It pisses off all the other housewives in the neighborhood. Now to get to work…hope everyone is having a great week! Yesterday, the House Small Business Committee, Subcommittee on Investigations and Oversight held a hearing on The Consumer Product Safety Improvement Act and its impact on small businesses. Rick Woldenberg has a post up about the hearing and subsequent press release of the committee. In other news, the CPSC voted yesterday on NAM’s request for stay of enforcement on Tracking Labels. It was a split decision between Nancy Nord and Thomas Moore…ugh! That means it was denied! NAM says labeling fosters confusion. More posted on Amend the CPSIA here. 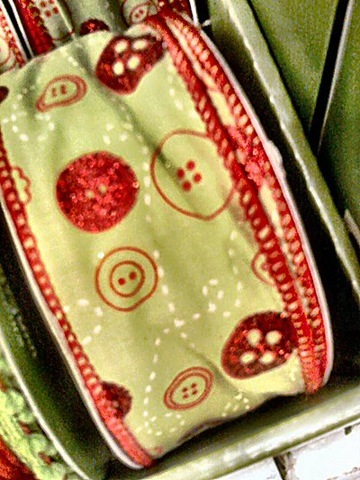 Oh…I’m missing Quilt Market with Lady M™ and Mary the Craft Addict™ this weekend! 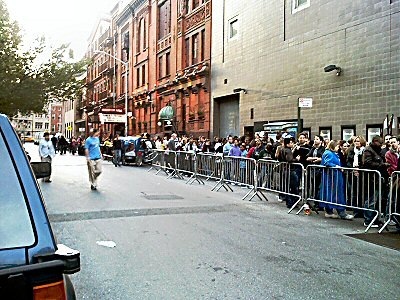 I should be there in Pittsburgh, but I’m not. DRATS! 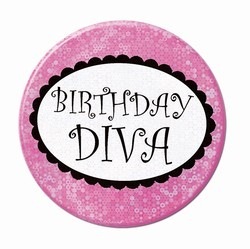 And a big HAPPY BIRTHDAY to Patty Young (aka ModKid Boutique)! She, too, will be at Quilt Market (Booth #2531) having a blast without me! 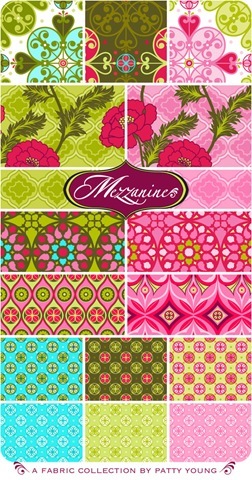 Be sure to stop by her booth and check out her new Mezzanine fabric line for Michael Miller! 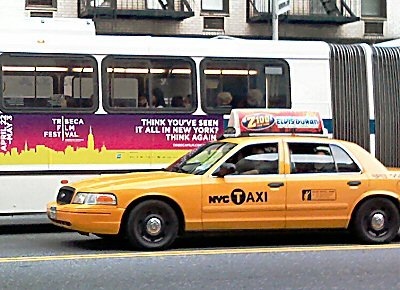 Think you’ve seen it all in New York? Think Again. 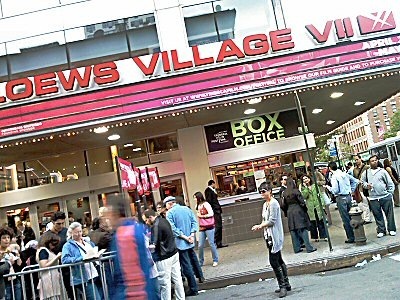 My nephew just arrived home from the Navy after an 8-month deployment, so we spend Saturday at the Tribeca Film Festival to see the screening of Cropsey. 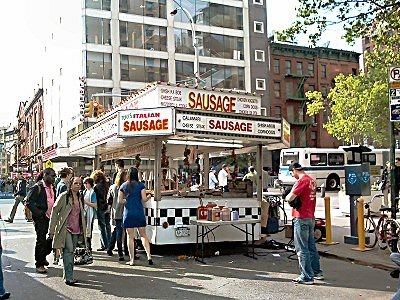 There was a street fair with everything from Italian sausage to funnel cakes. 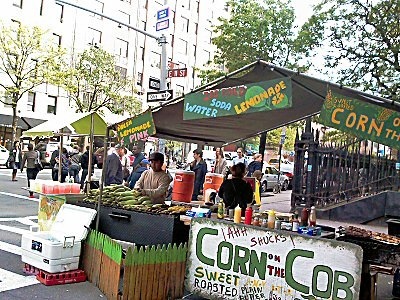 We went for a quick bite at The Smith on 3rd Avenue. Instead of having my regular favorite, I opted for a more health conscious organic roasted chicken. Pretty good. For anyone who knows me, eating healthy is something I NEVER do. I’m all about high fat foods and extra toppings. Bathe me in butter and I’m good to go, KWIM? But I’m making an attempt–working out with my personal trainer at least twice a week and not eating Wise Cheese Doodles every night. The good news is I’ve lost at least 8 pounds and I haven’t had to give up my Vanilla Creamer! While I had my nephew and his girlfriend hold my spot in line (I was third…WOO HOO), I ran over to Stogo to get some healthy organic ice cream. 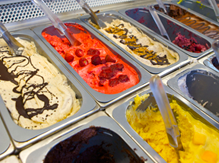 So many awesome flavors…I had some coconut vanilla bean ice cream with hot caramel. YUMMY! So, about the movie…OMG! It was AWESOME! Check out the Cropsey Movie Trailer! The Cropsey Legend began many years ago in Upstate New York. Basically, it’s a name we give a bogeyman. 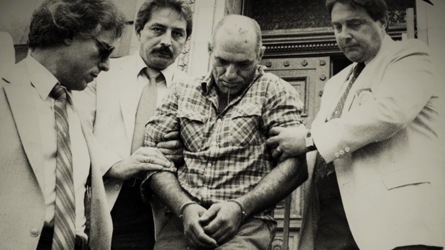 For many years, Staten Islanders had their own “Cropsey,” Andre Rand, who was convicted of murdering a local child. Police believe he is responsible for other unsolved missing children cases in Staten Island. At the end of the movie, the directors did a Question and Answer session with the audience. Talk about cool! Even the detectives and psychiatrist were in the audience to answer questions! Double cool! Now I need to get back to my sewing room. 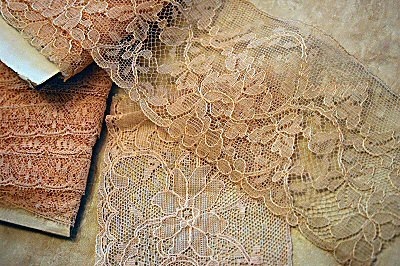 Because of all the interior painting we are doing, I know find I need lots of new window treatments to match. Fun, fun, fun…LOL! I’ve been quite busy with having my home repainted. It’s amazing how much stuff we’ve accumulated since we last painted 5 years ago. The first thing to be painted were closets throughout the entire house. Now granted, the closets didn’t need to be painted as the paint was still in great shape. However, it gave me an opportunity to reorganize them all (and of course, I got to use my handy dandy label maker). Although our house looked like a hurricane swept through, it was so worth it! 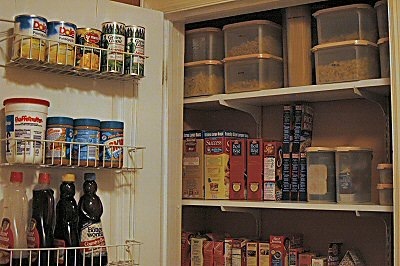 I can easily find items in my pantry and my linen closet never looked better. I donated all my unwanted towels, sheets and placemats to a local animal shelter. Now I have room to add new linens to match the new paint colors. Marielle’s room is FINALLY finished (well, except for a few little odds and ends)! I only have a few sneak peeks of her room as we are still trying to find space to store all her junk. Not only did we paint the walls hot pink and most of the trim black, we even painted her vanilla-colored furniture white. Marielle suggested we do black velvet curtains. But in the meantime, I ordered 2″ black aluminum blinds for her huge window (because we all know how long it will take me to sew her curtains…LOL). 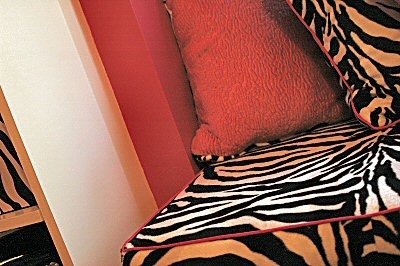 I’ve been buying and hoarding anything zebra, hot pink and/or black for the last year. My efforts have finally paid off. Most of my best finds were at either HomeGoods, TJ Maxx or Marshall’s. The hot pink lunch boxes were only $3.99 each. And the zebra canisters were only a few bucks. Oh and the hat box (which also has 4 coordinating big boxes) was only $5.99! Score! Check out this matching doll I bought while hunting for zebra items on Ebay! Marielle asked that I stop buying anything with a zebra print on it as she thinks it’s starting to look like a zebra puked in her room…haha! Since my darling daughter has a habit of writing on her closet walls (Marielle loves Anthony, Steven, Adam, Nick), we painted black chalkboard paint so we can just erase past boyfriends’ names instead of having to cross them out. How clever am I? 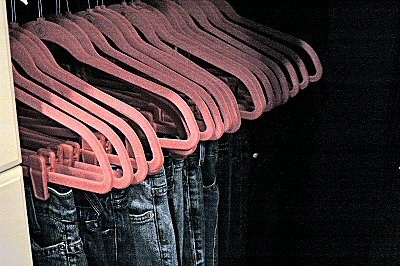 Oh, speaking of closets, I caved in and got her 300 hot pink Huggable Hangers. 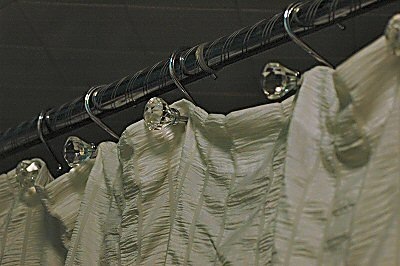 I absolutely LOVE these hangers (might have to buy them for every closet in the house). The above hangers may not look hot pink, but they certainly are. 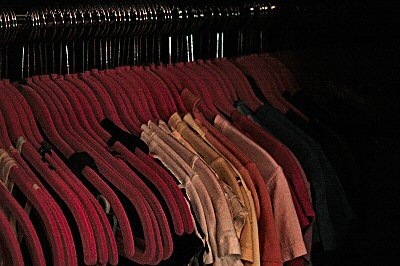 It’s pretty hard to get the correct color when editing photos of a black closet. 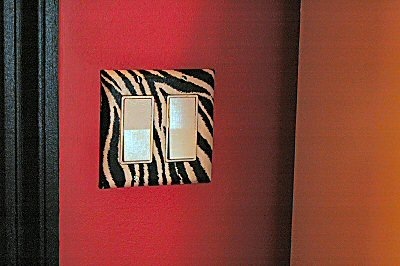 I purchased zebra light switch and outlet covers on Etsy. Only problem is I ordered the wrong type outlet covers (I need the new rocker type covers). So I’ll be doing a craft project this week–covering her old white outlet covers with some zebra wrapping paper and a little decoupage. Wish me luck! 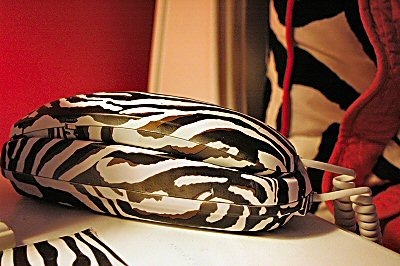 I found this cool zebra phone at Marshall’s for just $12.99. Perfect! This weekend I spent spray painting different things for her room in gloss black and semi-gloss white. I had found this neat shelf (once gold) at TJ Maxx for a mere $12.99 last year. 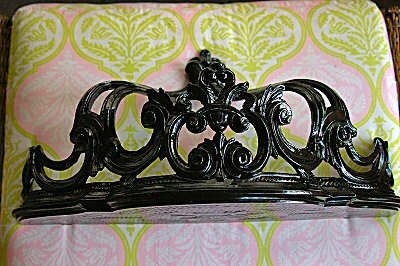 The minute I saw it, I knew if turned upside down it would be a perfect bed crown for my daughter’s room. A little black paint and now to find the zebra sheer fabric to attach to the bed crown which I have stashed somewhere in my sewing room…I’ll show you photos of it once I get it hung on the wall over her bed. 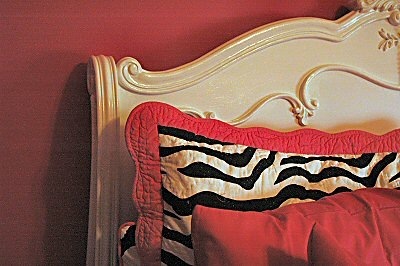 I’ve got to figure out a good way to attach the zebra sheers to the bottom of the new bed crown. Any ideas? I hadn’t finished spray painting Marielle’s light pink wicker rolling baskets when those two darn ducks took over the yard. Yes, they’ve been coming to my yard every stinkin’ day to eat all my Koi fish food. 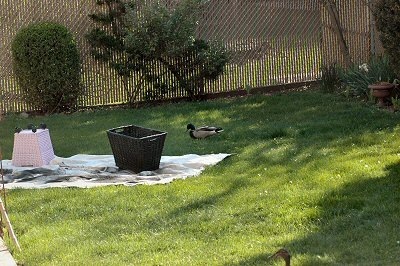 Any good ideas on how to get these ducks out of my yard once and for all? It’s getting a little old chasing them around with a broom, KWIM?